I do accounting for a small property management company in Pittsboro and am working on my MBA on the side. With all those things plus Crossfit, I don’t have much additional free time, but I’ve definitely become more social since I joined CFS. 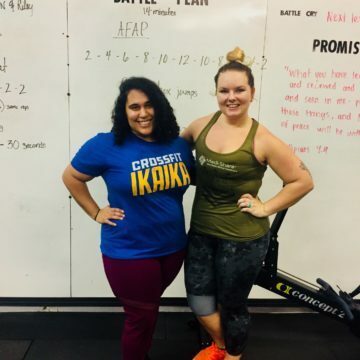 I got involved in Crossfit because I got tired of feeling sorry for myself. I work in Pittsboro and live in Raleigh, so I would drive by the box everyday. One day I got the courage to stop in and see what it was all about and I never looked back. I always used to blame knee pain for my sedentary lifestyle, but when I walked in to the box I saw people with different braces and accommodations. I couldn’t really use knee pain as a crutch after that. Truth be told, most of my first workout was kind of a blur, probably because of the pure shock of it all. I do remember it was May 26, I think of that as a rebirth of sorts. But I’m pretty sure the workout involved kettlebells. Current goals are to reach the 200# club on my squats and to complete the Wodbody Wars competition which falls on my 25th birthday. What better way to celebrate a quarter century, amirite? Favorite activity involves anything with a barbell, although more in the spirit of one rep maxes, not endurance. Conditioning is a weak spot of mine which I hope to improve this year. My favorite PR/Bright Spot was completing my first competition at the box (shoutout to Lee, Wayne, and Kelly P. for tolerating me). They needed a fourth member and I kind of volunteered before I could talk myself out of it. With all the adrenaline I ended up PRing my deadlift by like 40# or something. I went home and called my mom and just kinda cried cause I never thought I’d show up for more than three weeks, much less try and do the first competition that came along. Definitely prefer strength to conditioning. But I’m trying to stop dreading burpees, running, and the like and think of more as an opportunity than a chore. Favorite foods include Brussels sprouts, zucchini, and sweet potatoes. I really enjoy cooking. Combined with touring and Broadway I’ve seen over 75 theatre shows. If you looked at my music playlists you would probably think it’s still 2004.